The scene is dark, the lightening loud, and, echoing off the dank walls of the laboratory, comes the words, "Throw the switch...Fritz!" It sounds utterly strange to modern-day viewers, but when the movie factories of 1931 gave us one of the first (of many) attempts to bring Mary Shelley's gothic horror Frankenstein to film, it was not the iconic Igor who was the resident hunchback, but Fritz. 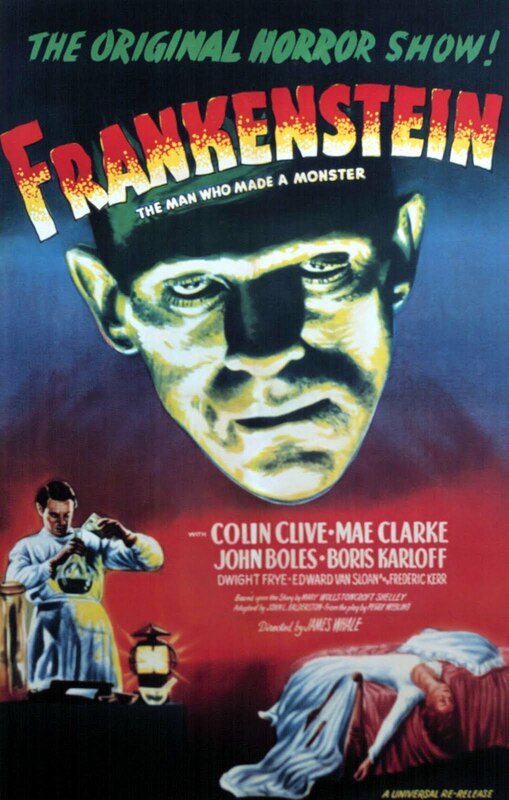 When even simple name-changes can be discombobulating, it can be hard to deconstruct such a prevalent tale from today's pop-culture to examine it on it's own merits, but, though the twisted tale is familiar to anyone who's ever danced along to the "Monster Mash," Frankenstein, as a film, was groundbreaking horror for it's time. Before the movie begins, the director of the film comes out to warn viewers of the strange, nerve-chilling images they are about to see. If they are of a sensitive nature, he advises, they should leave now. Warning administered, the film proper begins. It starts with a funeral and a grave robbing. Frankenstien is collecting parts for his "expeirments," which he performs in a crumbling castle, shut away from the world. On the night of his greatest experiment he gets some unexpected visitors: his old university professor, his best friend, and his fiancee. They have come to convince him to return to the world, but instead get to witness the creature's birth. But what is it-man, or monster? 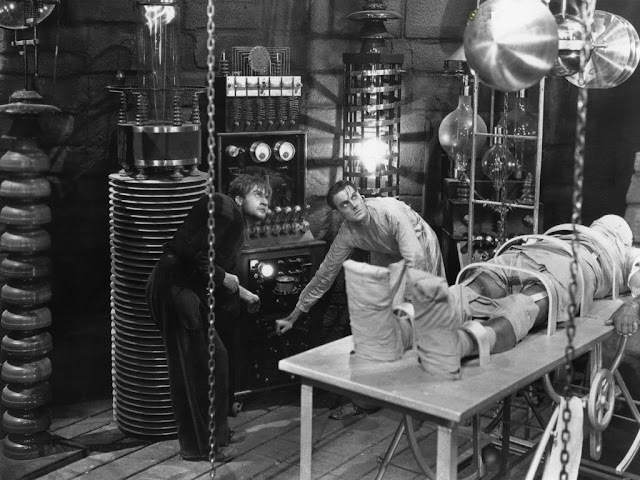 And what ultimate fate lies in store for Frankenstein's creation? It is easy to see why the film has been deemed "historically and culturally significant" by both the Library of Congress and the American Film Institute. In the years since other- and possibly better- re-imaginings of the book have been made. But the iconic scenes of this first film have left their fingerprints on all others since, with a filming style the horror genre still uses today. The black and white film too lends itself well to some masterful lighting that makes what today's viewers might term an otherwise lacklust film into something a little more electric (in both the literal and not-so-literal senses!). The lightening filled labartory and the monster's birth were especially beautifully filmed. For myself, the film's main flaw is based in the fact that it is only loosely following Shelley's classic tale. In her story, like in the movie, a man brings a creature to life. However, in the book, this creature has intelligent thought, and is portrayed as sensitive and philosophic. Shelly's creature makes a very deliberate decision to turn to violence. Her story's haunting question seems to be whether it is the creature or the man who is the monster. All that is lost in the movie. From the moment of his "wakening" the creature is a violent, murdering thing, more animalistic than anything else. Overall, the loss of theme weakened the plot for me. However, it is still undeniable that the 1931 movie has made its mark on pop culture, and is still a great choice if what you want is dark and spooky castles, ill-lit and full of murdering monsters. An excellent choice. I've always liked the classic monster movies and I think my appreciation for them benefited from seeing them at a young age. The scene in "Frankenstein" with the little girl is particularly shocking considering when the film was released. Your assessment of the film in comparison to the book is spot on. Have you seen Abbott and Costello Meet Frankenstein? It's a great parody of Classic Horror movies. I'd never considered how shocking the little girl part must have been, but you're totally right! I've never seen Abbot and Costello Meet Frankenstein. I'll have to add it to my list of films to see! It's on Netflix-- looking forward to your review! I was going to watch How To Steal A Million but Netflix took it away :( I'm keeping my eyes peeled for it though. Oh, I've never seen this! surely amazing, I really like this fiiilm! a classic! I remember this. We did this at school, must have been 8 years ago now. You did it? As in a play? Or watched it as a part of a class? Either way, how fun! I always love reading your movie reviews. Again, I remember watching this film many times as a kid with my grandparents. Of course, being the scaredy cat that I am, it always frightened my elementary aged self - though in reality it's rather corny (but in a good way). I always leave your page feeling the need to re-watch all these classics I haven't seen in years! I love that you watched all these types of films with your grandparents. It is always fun to hear and think about the connections people make with films and family/friends. We watched a lot of older films with my dad growing up, but not the scary ones. more likely the Tarzan, adventure like ones.